Present : all my Lords. The bidding for the lotteries to be put off to Friday afternoon next. Major Wildman is called in and [? is] acquainted by [? my Lords of] his Majesty's order of Wednesday last that he [? the King] had been informed that the pacquet boat had not the full number of men pretended ; he says he has at three several times sent down to muster them upon surprise and has not found any wanting and he has taken care that they be also mustered at the Brill and by the accounts he receives he cannot find they have been faulty. He is told [by my Lords] that the pacquet boats carry over many goods and merchandises which encourages the privateers to attack them. He says that what are carried over are brought to the King's account and that most commonly they are goods etc. for the use of the Army : and that for the boats in Wales they are hired boats and are obliged not to stay for goods or passengers and to make the first land in England or Scotland. The business of the warrant for felling 5,500l. worth of timber in New Forest for Mr. Fitch [is considered], Lord Lovelace, Chief Justice in Eyre, Trent South, being present. Four papers of complaints, one of Mr. Hobby, one of Mr. Whitehead, one of Mr. Knapton and one of some of the officers of the forest, were all read. Ryley [replies] the officers of the Navy were here [in London], but being commanded to Portsmouth they have left their affidavits. Mr. Ryley's answer is read, also William Eddy's affidavit and Thomas Podd's affidavit. He [Ryley] says that other gentlemen are here to attest that none of the trees by him marked are ship timber. Mr. Grey says he was at the sale and there is not one sound tree and not one fit for the Navy [among the trees felled] and if 20,000l. worth were cut the forest would be better for ship timber's growth. Ryley says he found there was such opposition against their Lordships granting the warrant that he took extraordinary attestations of what he did. Mr. Hoar says he saw never a tree markt but what had visible defect ; that 500 other trees are markt for the Navy that are good. The Chancellor [of the Exchequer] : If you [? Grey or Fitch] deal with the Navy do not you buy several trees that have defects and sell them afterwards to the Navy, for part of a tree may be good. Answer : so much as shall be found good, when 'tis converted. Ryley : The officers of the Navy do say the defect is in the very great age of these trees. Mr. Grey : I would not give 6s. a ton for all the trees marked for this sale. Mr. Pelham : There was one tree of 23 tons. Fitz [Mr. Fitch] : any gent, shall have all these trees for 9s. a ton. 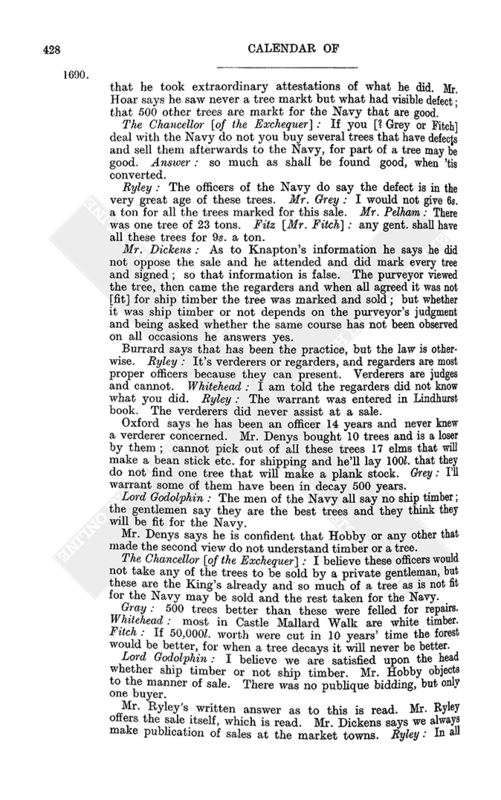 Mr. Dickens : As to Knapton's information he says he did not oppose the sale and he attended and did mark every tree and signed ; so that information is false. The purveyor viewed the tree, then came the regarders and when all agreed it was not [fit] for ship timber the tree was marked and sold ; but whether it was ship timber or not depends on the purveyor's judgment and being asked whether the same course has not been observed on all occasions he answers yes. Burrard says that has been the practice, but the law is otherwise. Ryley : It's verderers or regarders, and regarders are most proper officers because they can present. Verderers are judges and cannot. Whitehead : I am told the regarders did not know what you did. Ryley : The warrant was entered in Lindhurst book. The verderers did never assist at a sale. Oxford says he has been an officer 14 years and never knew a verderer concerned. Mr. Denys bought 10 trees and is a loser by them ; cannot pick out of all these trees 17 elms that will make a bean stick etc. for shipping and he'll lay 100l. that they do not find one tree that will make a plank stock. Grey : I'll warrant some of them have been in decay 500 years. Lord Godolphin : The men of the Navy all say no ship timber ; the gentlemen say they are the best trees and they think they will be fit for the Navy. Mr. Denys says he is confident that Hobby or any other that made the second view do not understand timber or a tree. The Chancellor [of the Exchequer] : I believe these officers would not take any of the trees to be sold by a private gentleman, but these are the King's already and so much of a tree as is not fit for the Navy may be sold and the rest taken for the Navy. Gray : 500 trees better than these were felled for repairs. Whitehead : most in Castle Mallard Walk are white timber. Fitch : If 50,000l. worth were cut in 10 years' time the forest would be better, for when a tree decays it will never be better. Lord Godolphin : I believe we are satisfied upon the head whether ship timber or not ship timber. Mr. Hobby objects to the manner of sale. There was no publique bidding, but only one buyer. Mr. Ryley's written answer as to this is read. Mr. Ryley offers the sale itself, which is read. Mr. Dickens says we always make publication of sales at the market towns. Ryley : In all the sales the method is for the surveyor, woodward, regarders [to] value the tree ; every one enters in a book and then you sell them at those values. The woodward and regarders told me, we proclaim the sale, mark 10 trees, and then sell. I told them the buyers might then have them at their own rates by combining amongst themselves. In the other method (practised in all other forests and in private woods) the King is sure to have the value. Don't bid against me in this bargain, and I'll not bid against you in the next is a common thing. Dickens : There was discourse between Mr. Ryley and me. At first I told him the way of our forest should be continued. but he giving me reasons I was convinced. The poor people there were never able to buy a quarter. Penny : if this timber had been to have been sold to the country people it would not have fetched so much by 500l., but then they never would have complained. 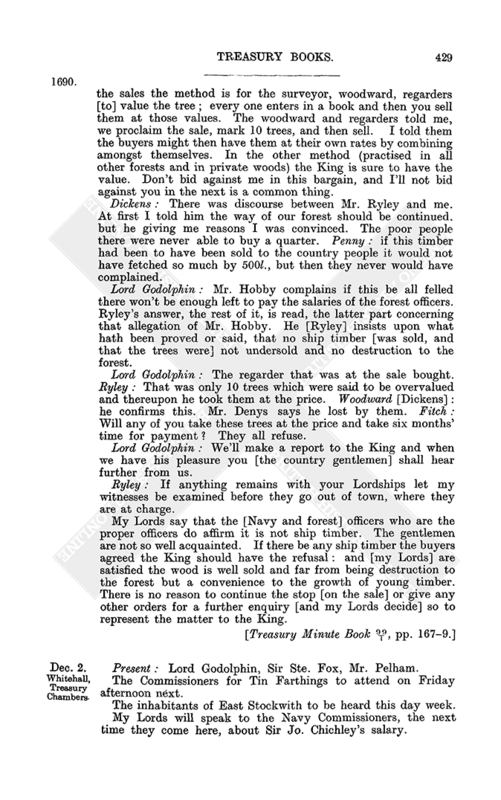 Lord Godolphin : Mr. Hobby complains if this be all felled there won't be enough left to pay the salaries of the forest officers. Ryley's answer, the rest of it, is read, the latter part concerning that allegation of Mr. Hobby. He [Ryley] insists upon what hath been proved or said, that no ship timber [was sold, and that the trees were] not undersold and no destruction to the forest. Lord Godolphin : The regarder that was at the sale bought. Ryley : That was only 10 trees which were said to be overvalued and thereupon he took them at the price. Woodward [Dickens] : he confirms this. Mr. Denys says he lost by them. Fitch : Will any of you take these trees at the price and take six months' time for payment? They all refuse. Lord Godolphin : We'll make a report to the King and when we have his pleasure you [the country gentlemen] shall hear further from us. Ryley : If anything remains with your Lordships let my witnesses be examined before they go out of town, where they are at charge. My Lords say that the [Navy and forest] officers who are the proper officers do affirm it is not ship timber. The gentlemen are not so well acquainted. If there be any ship timber the buyers agreed the King should have the refusal : and [my Lords] are satisfied the wood is well sold and far from being destruction to the forest but a convenience to the growth of young timber. There is no reason to continue the stop [on the sale] or give any other orders for a further enquiry [and my Lords decide] so to represent the matter to the King. Present : Lord Godolphin, Sir Ste. Fox, Mr. Pelham. The Commissioners for Tin Farthings to attend on Friday afternoon next. The inhabitants of East Stockwith to be heard this day week. My Lords will speak to the Navy Commissioners, the next time they come here, about Sir Jo. Chichley's salary. The officers of the Ordnance to attend on Friday afternoon next. The Customs Commissioners and Mr. Colt are called in. Mr. Colt offers a scheme of the frauds at Bristol. Mr. Rowe offers a paper concerning the same, which is read, being his Information. Mr. Colt said, I appointed Mr. Row and Mr. Flight to the ship, but at Rowe's request Thomas Ballard. 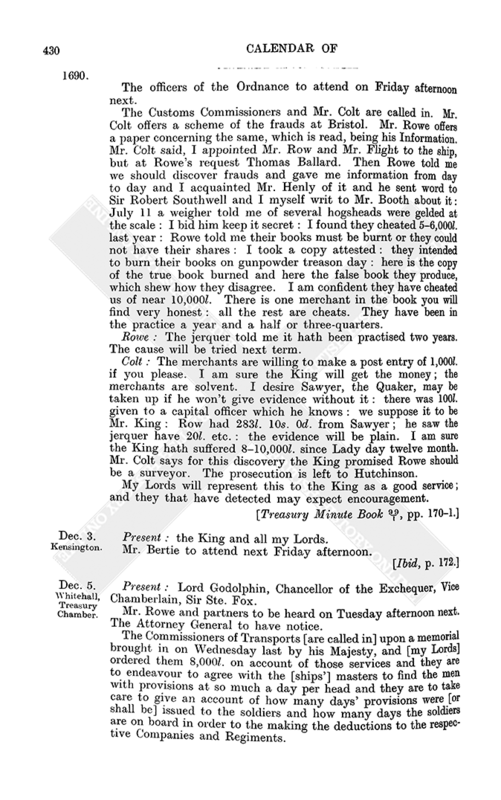 Then Rowe told me we should discover frauds and gave me information from day to day and I acquainted Mr. Henly of it and he sent word to Sir Robert Southwell and I myself writ to Mr. Booth about it : July 11 a weigher told me of several hogsheads were gelded at the scale : I bid him keep it secret : I found they cheated 5-6,000l. last year : Rowe told me their books must be burnt or they could not have their shares : I took a copy attested : they intended to burn their books on gunpowder treason day : here is the copy of the true book burned and here the false book they produce, which shew how they disagree. I am confident they have cheated us of near 10,000l. There is one merchant in the book you will find very honest : all the rest are cheats. They have been in the practice a year and a half or three-quarters. Rowe : The jerquer told me it hath been practised two years. The cause will be tried next term. Colt : The merchants are willing to make a post entry of 1,000l. if you please. I am sure the King will get the money ; the merchants are solvent. I desire Sawyer, the Quaker, may be taken up if he won't give evidence without it : there was 100l. given to a capital officer which he knows : we suppose it to be Mr. King : Row had 283l. 10s. 0d. from Sawyer ; he saw the jerquer have 20l. etc. : the evidence will be plain. I am sure the King hath suffered 8-10,000l. since Lady day twelve month. Mr. Colt says for this discovery the King promised Rowe should be a surveyor. The prosecution is left to Hutchinson. My Lords will represent this to the King as a good service ; and they that have detected may expect encouragement. Present : the King and all my Lords. Mr. Bertie to attend next Friday afternoon. Present : Lord Godolphin, Chancellor of the Exchequer, Vice Chamberlain, Sir Ste. Fox. Mr. Rowe and partners to be heard on Tuesday afternoon next. The Attorney General to have notice. The Commissioners of Transports [are called in] upon a memorial brought in on Wednesday last by his Majesty, and [my Lords] ordered them 8,000l. 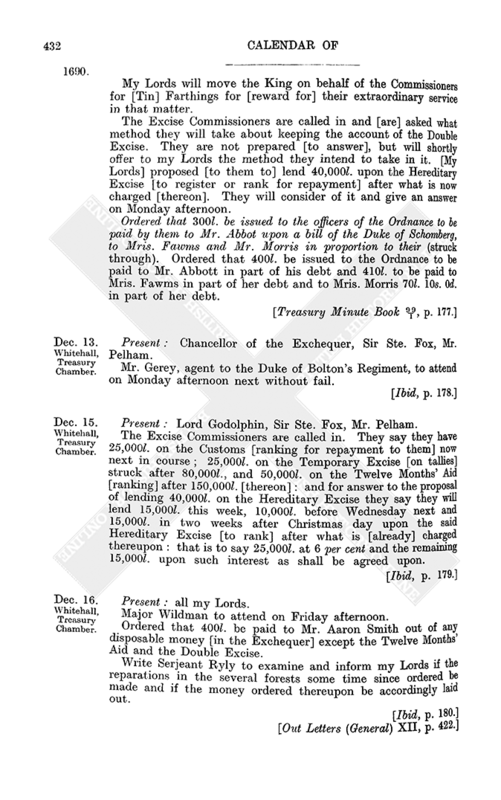 on account of those services and they are to endeavour to agree with the [ships'] masters to find the men with provisions at so much a day per head and they are to take care to give an account of how many days' provisions were [or shall be] issued to the soldiers and how many days the soldiers are on board in order to the making the deductions to the respective Companies and Regiments. 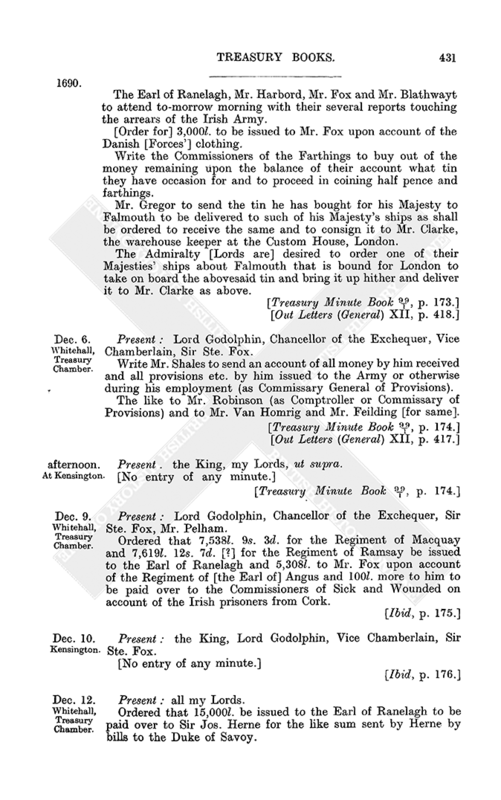 The Earl of Ranelagh, Mr. Harbord, Mr. Fox and Mr. Blathwayt to attend to-morrow morning with their several reports touching the arrears of the Irish Army. [Order for] 3,000l. to be issued to Mr. Fox upon account of the Danish [Forces'] clothing. Write the Commissioners of the Farthings to buy out of the money remaining upon the balance of their account what tin they have occasion for and to proceed in coining half pence and farthings. Mr. Gregor to send the tin he has bought for his Majesty to Falmouth to be delivered to such of his Majesty's ships as shall be ordered to receive the same and to consign it to Mr. Clarke, the warehouse keeper at the Custom House, London. 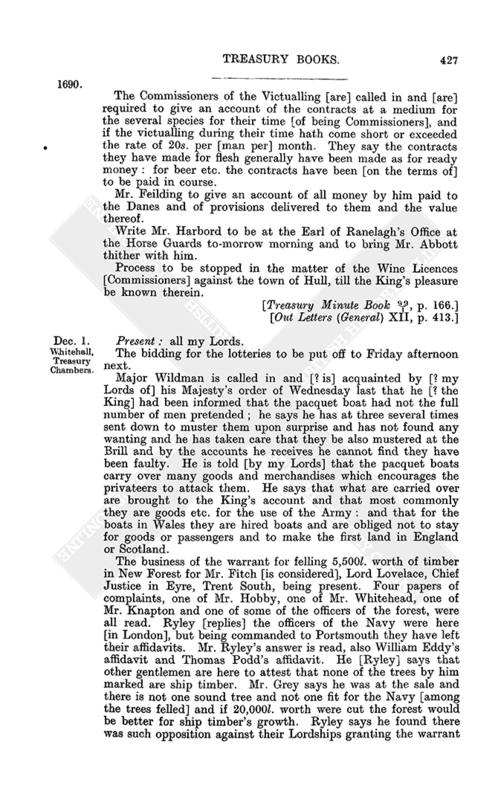 The Admiralty [Lords are] desired to order one of their Majesties' ships about Falmouth that is bound for London to take on board the abovesaid tin and bring it up hither and deliver it to Mr. Clarke as above. Write Mr. Shales to send an account of all money by him received and all provisions etc. by him issued to the Army or otherwise during his employment (as Commissary General of Provisions). The like to Mr. Robinson (as Comptroller or Commissary of Provisions) and to Mr. Van Homrig and Mr. Feilding [for same]. Present : the King, my Lords, ut supra. Present : Lord Godolphin, Chancellor of the Exchequer, Sir Ste. Fox, Mr. Pelham. Ordered that 7,538l. 9s. 3d. for the Regiment of Macquay and 7,619l. 12s. 7d. [?] for the Regiment of Ramsay be issued to the Earl of Ranelagh and 5,308l. to Mr. Fox upon account of the Regiment of [the Earl of] Angus and 100l. more to him to be paid over to the Commissioners of Sick and Wounded on account of the Irish prisoners from Cork. Present : the King, Lord Godolphin, Vice Chamberlain, Sir Ste. Fox. Ordered that 15,000l. be issued to the Earl of Ranelagh to be paid over to Sir Jos. Herne for the like sum sent by Herne by bills to the Duke of Savoy. My Lords will move the King on behalf of the Commissioners for [Tin] Farthings for [reward for] their extraordinary service in that matter. The Excise Commissioners are called in and [are] asked what method they will take about keeping the account of the Double Excise. They are not prepared [to answer], but will shortly offer to my Lords the method they intend to take in it. [My Lords] proposed [to them to] lend 40,000l. upon the Hereditary Excise [to register or rank for repayment] after what is now charged [thereon]. They will consider of it and give an answer on Monday afternoon. Ordered that 300l. be issued to the officers of the Ordnance to be paid by them to Mr. Abbot upon a bill of the Duke of Schomberg, to Mris. Fawms and Mr. Morris in proportion to their (struck through). Ordered that 400l. be issued to the Ordnance to be paid to Mr. Abbott in part of his debt and 410l. to be paid to Mris. Fawms in part of her debt and to Mris. Morris 70l. 10s. 0d. in part of her debt. Present : Chancellor of the Exchequer, Sir Ste. Fox, Mr. Pelham. Mr. Gerey, agent to the Duke of Bolton's Regiment, to attend on Monday afternoon next without fail. The Excise Commissioners are called in. They say they have 25,000l. on the Customs [ranking for repayment to them] now next in course ; 25,000l. on the Temporary Excise [on tallies] struck after 80,000l., and 50,000l. on the Twelve Months' Aid [ranking] after 150,000l. [thereon] : and for answer to the proposal of lending 40,000l. on the Hereditary Excise they say they will lend 15,000l. this week, 10,000l. before Wednesday next and 15,000l. in two weeks after Christmas day upon the said Hereditary Excise [to rank] after what is [already] charged thereupon : that is to say 25,000l. at 6 per cent and the remaining 15,000l. upon such interest as shall be agreed upon. Major Wildman to attend on Friday afternoon. Ordered that 400l. be paid to Mr. Aaron Smith out of any disposable money [in the Exchequer] except the Twelve Months' Aid and the Double Excise. Write Serjeant Ryly to examine and inform my Lords if the reparations in the several forests some time since ordered be made and if the money ordered thereupon be accordingly laid out. Present : Lord Godolphin, Vice Chamberlain, Sir Ste. Fox, Mr. Pelham. The undertakers for providing cloth etc. for the Danish [Forces'] clothing [are called in] : they are offered [by my Lords] to have 2,000l. a week for the first three weeks in January and [such] a fund for the remainder as shall be agreed upon. They are to come again on Monday next and give their answer. Sir Cha. Porter's deputy to attend on Monday next. Mr. Bridges [is called in] upon Pereira's contract. He is told that for the payment of the first two months there is not money at present, but if he will make or procure a loan on the Twelve Months' Aid the same shall be issued for that service. He will do his best, but desires some money before the holidays. Sir Joseph Herne called in about the payments to be made to the Duke of Savoy. He proposes to return [to forward by bills] the money and make punctual payments according to the Earl of Nottingham's letter of the 18th inst. and to have tallies for the money upon the Double Excise or to have a weekly sum payable thereout. My Lords will acquaint his Majesty on Wednesday and receive his directions thereupon. Mr. Aaron Smith to attend the Attorney General and receive his instructions touching the bill of the Aulnage now in the House of Lords ; and to inform such of the King's learned counsel as are not members of the House of Commons in order to their attending the Lords House at such times as shall be appointed (struck through) on Friday next. Write the officers of the Ordnance not to pay any money to any ships taken up by them and now in the King's service or discharged, which are now in the river, until they have been re-measured by Mr. Bowles, who has their Majesties' commission for that service : and likewise to pay no money to the Mary Catt, Thomas Nicholls master, at Poole till she be also measured. Sir Hen. Goodrick acquaints my Lords that 16,000l. is due to artificers for small arms and proposes to have 6,000l. in money and assignments for the remainder ; which he is of opinion will serve for an encouragement to the artificers to proceed on their new contracts : and that his Majesty may be moved for the continuance of the ordinary to that [the Ordnance] Office in such proportion as his Majesty shall think fit ; and for Sir Polycar. Wharton 1,000l. to enable him to go on with his works. The merchants for the Danish [Forces'] clothing are called in and are told they shall have a good fund for their money ; upon which assurance they promise to proceed. Mr. Blathwaite and Mr. Charles Fox to attend to-morrow afternoon. Mr. Butler, Sir Cha. Porter's deputy, is called in. He produced an authority from Sir Charles for paying Mr. Evelyn his debt out of the profits of the [First Fruits] Office with such interest as Lord Godolphin shall appoint. A copy of that authority to Mr. Butler is to be entered here [at the Treasury] and the original to be re-delivered to him. He is to lay before my Lords a table of the fees in the Office of First Fruits and Tenths. Mr. Young to be written to to pay the salaries due to Mr. Chair et al. (the rest of the present Commissioners of the Wine Licences) or to give my Lords an account why he refuses the same. Major Wildman to hasten his reports on the several proposals for settling a Penny Post in the country. Ordered that 356l. 14s. 8d. be issued to Mr. Fox to be by him paid over to the Controller [of Army Provisions] in full of the surplus of his account. The Customs Commissioners to attend on Friday afternoon next. The Commissioners of the Prizes to attend on Friday afternoon next. The 50,000l. formerly issued to Mr. Fox and yet undisposed of is to be sent forthwith into Ireland to be there paid weekly according to the proportions mentioned in a paper offered by Mr. Blathwayte ; to commence from Jan. 1 next ; to be paid only for the effective men found [on the muster rolls] for the months of January and February ; and for the month of March to be paid as full, provided they be full [on the muster roll at] the 1st of April. This only for the recruits made in England. In the margin : 1690, Dec. 31, the officers to be allowed 20s. a man for recruits and upon producing 10 men to Mr. Henley at Bristol [or] Mr. Allen at Chester [or] the Collector of Whitehaven port [then] to enter into pay. Mr. Dodington and his partners [in the undertaking] for the clothing are to attend on Friday afternoon next. Mr. Scawen and partners to attend at the same time. The three French Regiments are to clothe themselves. The Excise Commissioners to attend on Friday afternoon next. A state to be made up of what is due to the late Duke of Schonbergh upon his several appointments and to be laid before the King next Wednesday. Ordered by the King that 1,000l. be paid to me [Jephson] for the French Protestants out of the temporalities of the vacant bishoprics. Sir Joseph Herne [is called in] about returning [finding bills of exchange for remitting] the money for the Duke of Savoy. He offers to pay the [Duke's] Envoyé the money monthly to begin in January and to take his repayments on the Double Excise at 1,250l. a week, commencing from the first week in March [next]. My Lords do not come to a conclusion upon this fund, but will consider further of it. Monsieur Turton to attend on Monday afternoon next. The Commissioners of the Prizes are called in and [are] told that the King commands an account of all their receipts and payments. They say the account from Plymouth is come up and they are preparing a general account, which shall be laid before my Lords in a few days. The Agents of the Taxes to attend on Monday afternoon next. Ordered that 100l. be issued to Mr. Fox to be paid over to the Commissioners of Sick and Wounded for the Irish prisoners in the Marshalsea. 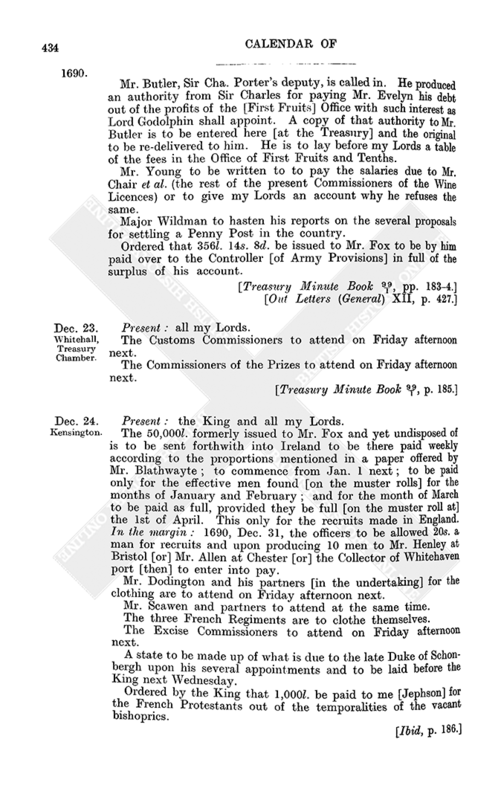 To move the King for money for the officers come out of Ireland in part of their pay to make [it possible for] them [to] live : money for the recruits ; money for subsisting the recruits ; money for clothing the recruits. Mr. Scawen and partners to attend to-morrow afternoon. The Earl of Ranelagh to attend to-morrow afternoon. Lieut. Col. Vaughan with the several tradesmen concerned in his petition to attend at the same time. Mr. Harbord to send my Lords a state of the manor of Reigate. Move the King about prohibiting [Customs] officers to visit goods at private houses, and men of war to bring any goods. 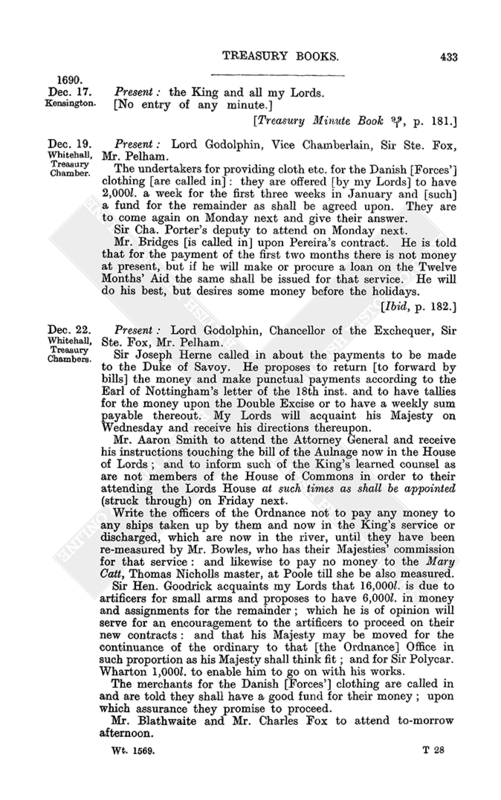 Monsieur Turton called in about returning [forwarding by bills] money to Savoy. He cannot advance at present so much. Present : the King, Lord Godolphin, Chancellor of the Exchequer, Sir Ste. Fox, Mr. Pelham. Mr. Bridges to attend on Friday afternoon next. A warrant for a privy seal to be prepared for 120l. per an. to Mr. Needham, during pleasure, from the time he went out of pay as a Page of Honour. The Attorney General to attend on Friday afternoon. The King orders 1,000l. per an. to be paid to the Master of the Horse for the maintaining 10 running horses. 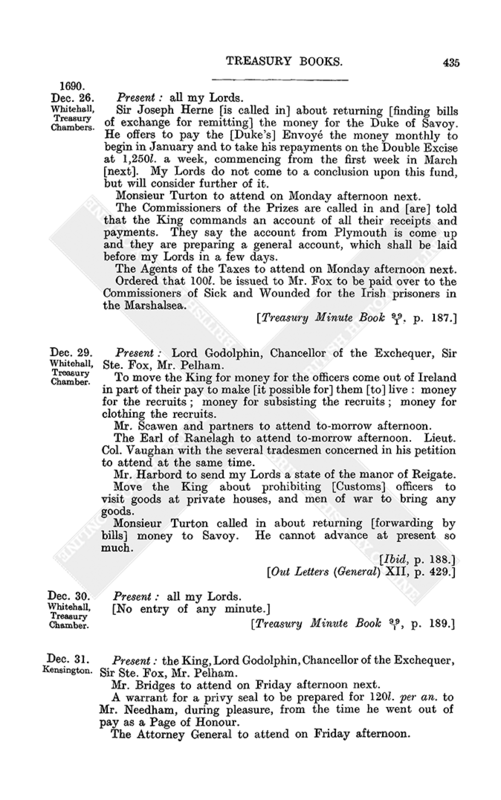 The King orders that money be paid to the officers come out of Ireland in part of their pay to make them [able to] live, likewise money for the recruits, for subsisting the recruits and for clothing the recruits. 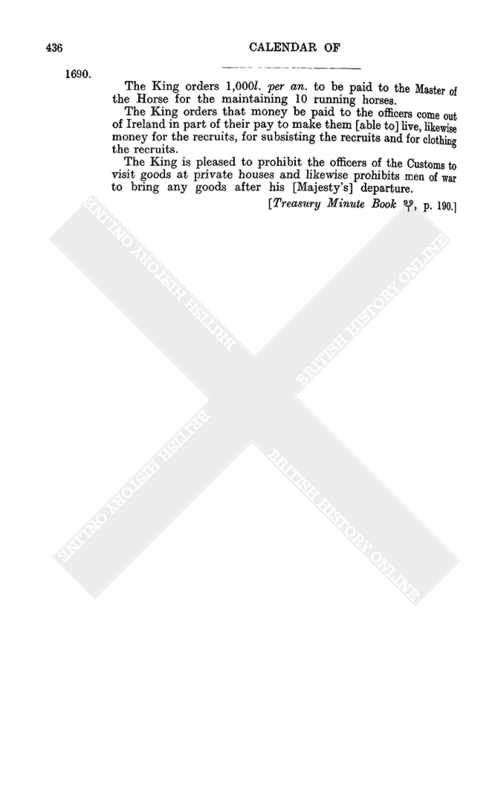 The King is pleased to prohibit the officers of the Customs to visit goods at private houses and likewise prohibits men of war to bring any goods after his [Majesty's] departure.